As I have mentioned in previous posts to other discussion threads, I'm designing and building circuits to adapt the K100 electrics to aftermarket gauges. As shown in the photo below, there is a separate 7-segment display board with a cable length of 150mm, however a custom length can be provided if required.. The intention with such a short cable is that the board and display will be together in an enclosure. It is possible that this arrangement does not meet with your intended design. When ordering, I will exchange information with you to understand how and where the board will get use. This allows me to tailor the display umbilical cable to a length that suits your build. The Gear Indicator and Start Enable Board also has circuitry to amplify and condition the speed signal coming off the rear drive. Many modern aftermarket speedometers require the use of an active inductive sensor that outputs large voltage levels (>7 volts) for the meter to work properly. This usually means adding a magnet and aftermarket sensor to the front wheel to get that signal. The variable reluctance (VR) sensor in the final drive of the K100 is not capable of reproducing these active signals without help. The circuit on this board will amplify the weak VR signal from the K100 sensor, making it usable for a range of aftermarket speedometers. This means one can re-purpose the OEM sensor and avoid adding additional sensors to the bike.. This feature means that you don't have to use the manufacturer's speed sensor and worry about finding a place to mount it. I have developed the next version of the TGPI board (v5.2). This version includes new functionality and a fundamental change in the design. There is a circuit now that will condition the engine RPM signal available on the Black/Blue wire (Pin 16) of the OEM cluster, and make the signal compatible with aftermarket tachometers. I have also included a more robust power supply onboard along with a resettable fuse and transient voltage protection. This will result in a more robust reliable board than previous designs. Finally I have integrated a circuit on the tachometer output that adjusts the signal to make it compatible with one particularly popular Chinese aftermarket gauge. The overall size of the board is 4cm X 6cm. The change in design with v5 means that I manufacture the board based on the type of display you desire. There are two versions of the build and unfortunately, they are not interchangeable between themselves. That means we collaborate during the ordering process to make sure I supply you with the correct version of the board. The tested board and LED display is targeted at $75.00 CDN plus shipping. If all you're interested in is just the speedometer amplifier circuitry or just the tachometer conditioning circuitry or both, it is possible for me to build only that function on the board and largely ignore the rest of the components. The cost is significantly reduced, down to $27.00 CDN plus postage, for that board. 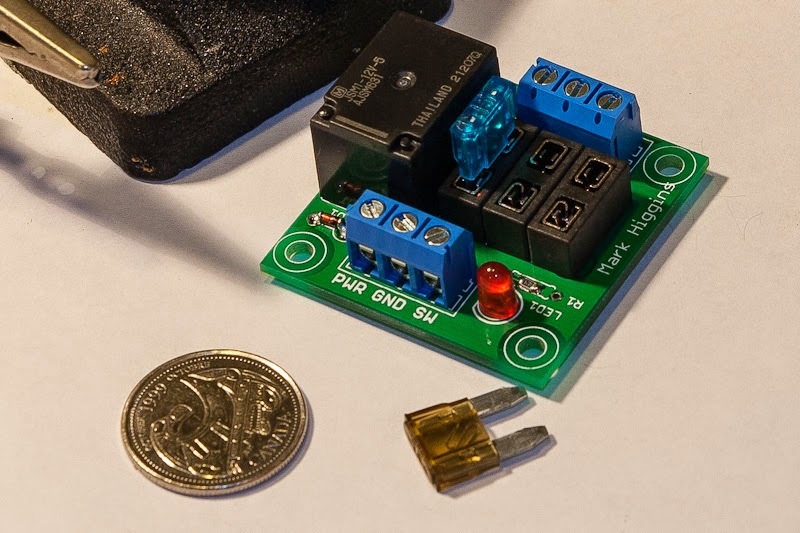 This board provides three switched 12 volt fused circuits in a compact 5cm X 5cm package for powering accessories that you add to your bike. The switching relay is provided on the card, which simplifies the installation. These circuits can handle up to 30A current total (the limit on the switching relay's contacts) and has a LED for power indication. The tested board is $21.00 CDN plus shipping. The prices are very close to my costs just for the parts that are used. I'm making no money on these, but making them available to support the community of K-bike owners. I have designed a printed circuit board to simplify the construction of the popular neutral detect circuit using four relays. The board using through hole components which should be easy to source locally in a number of markets. I was thinking of supplying this design in a flexible way, to meet different budgets and skill levels. The board overall is 5cm X 5.2cm in size. It will take input from the TGPI switch and output a Start Enable signal and an active-low Neutral signal whenever the transmission is in neutral position. Great stuff! Will be interesting to watch as it proceeds. Are you using PWM for the dimming? Yes, it uses a PWM to modulate the DC supply to the 7-segment display. It uses a pair of op-amps to create a sawtooth generator and comparator. The comparator level is adjusted with a light dependant resistor, which adjusts the display intensity proportional to the available light. Looks good. Are you using an LM1815 for the VR sensor? No, I hadn't based it on the LM1815. I am investigating the MAX 9924 instrumentation amp. I'll also look at the LM1815 to see if implementation is easier with that module. My motivation for this circuit is to get the OEM VR transducer to function with a Motogadgets speedometer on my K75. Either should work well. The LM1815 is a purpose built chip for VR sensors, with zero crossing and other modes. Overkill in some cases, but works great in others. Just when I think I have a rudimentary knowledge of motorcycle maintenance (this is my first bike and I am learning as I go on the DIY maintenance via this forum), I run across this thread and wonder if I am even in the same hemisphere with my understanding. I will keep watching but I don't think I will ever catch up with the knowledge/experience level I see here. Take a look at the trip computer thread, and the Megasquirt thread. Its my engineering fix (I'm pre-med [my real passion], and couldn't take engineering at Berkeley because of it). The great thing is everyone here is happy to share and teach. "Pre - med" .... Its all engineering! I am trying to replace the OEM speedo of my K75S1 with Daytona Velona speedometer using original speed sensor. Do you have any success with OEM speedometer sensor signal converter - amplifier? There is a speed sensor selling separately for Velona but I want to use the original one. You could remove the amplifier/conditioner from the cluster (it is located on a daughterboard, and outputs 6 5-volt pulses per wheel revolution. The raw output of the sensor is an a/c voltage from a vr sensor. It may or may not be compatible with the velona. Thank you for the reply. I am planning to build some cirquit diagram based on schmitt trigger. If it works I will post the results. Can I ask what you observed as the frequency and duty cycle for the output, per wheel rotation? The frequency at 100 km/h (60 mph) is approximately 100 Hz. It is easy to compute. The Impulse Sending Wheel has six sleeves and if the wheel is about 20 inches on the outer diameter on rear tire it travels 3.14 x 20 x 2.5 = 1.57 meters per revolution - 63700 revolutions on wheel per 100 km. 63700 revolutions x 6 sleeves = 382200 impulses for an hour. One hour has 3600 seconds so 382200/3600 is approximately 106 Hz on speed sensor. I tried to use a simple amplifier but there are too many noises from magnetic coil speed sensor so the speedometer going crazy. At constant speed 40 km/h it jumps from 40 to 200 and more. And I decided to build a Schmidt trigger circuit. With success. Excuse my bad English. I hope you can understand my post. Thanks Palmenk. That confirms what I suspected. The K sensor outputs 6 pulses per wheel revolution. I suspect the duty cycle of the square wave is 50%, since you are conditioning a sinusoidal input. The Schmitt trigger senses when the input crosses 0.1V, twice per cycle. This is good information for me. I'm attaching a Motogadgets speedo to my K75 and prefer to use the built-in sensor rather than the supplied sensor. This circuit will work for my installation as well. Yes that is true. And you can use any LM78XX. It depends of out voltage the speedo needs. But then the voltage divider resistor values have to change appropriately. Hi there , I'm also trying to keep the original speed sensor and mount a motogadget speedometer , is it working perfectly after 2 years ? Do you have any advices to give about the electronic modification ? I'm attaching a Motogadgets speedo to my K75 and prefer to use the built-in sensor rather than the supplied sensor. This circuit will work for my installation as well. Do you know if its possible to use the motogadget sensor in place of the built in sensor? I foolishly sold mine as I thought if I was buying a new speedo that I would just replace the whole shebang, when I now know I could have just adapted the original. Yes, it's possible to use the Motogadget spee sensor in place of the BMW OEM sensor with an aux. circuit. On the page you linked, choose the sensor labelled "Speedo sensor, M5 x 0.5 (spare part kit" for 21 Euro. Bear in mind that you'll have to mount this on the front wheel most probably. Correct me if I'm mistaken, but did you sell the OEM speed sensor? If so, what have you done with the rear drive to close off the hole where the OEM sensor used to sit? I sold the sensor a few months ago, and currently I have sealed the hole with plastic and electrical tape to stop anything getting into the hole. Though this is because the bike currently is sitting in the garage as it slowly gets built (also I'm waiting for my full licence so can't ride it). I'm going to look for a possible stopper or grommet to plug it, but failing that I know a 3d printing company that can print with rubber so will design and have some made. Actually I don't want to add on a front wheel a new sensor . But I'm asking myself about the input voltage in the motogadget speedometer, 5v (has written on the diagram) is OK ? ?